GoExplore Safaris invites you to join their safari tour in Kidepo Valley National Park, Uganda! Lies in the rugged, semi-arid valleys between Uganda’s borders with Sudan and Kenya, Kidepo is Uganda’s most isolated national park. Ranked among Africa’s finest wilderness, this national park will give you the experience to see over 77 mammal species as well as around 475 bird species! During this safari, you will be accommodated at Cassia Lodge and Kidepo Savannah Lodge. Depending on your arrival time, your GoExplore Safaris guide will meet you at Entebbe International Airport (EBB) and transfer you to Kampala for approximately 45 minutes. You will have your breakfast very early in the morning and drive toward the north of Uganda in Kidepo Valley National Park. Sometimes referred to as the true African wilderness, this park is one of the remotest and virgin tourism destinations in Uganda profane with the abundance of wildlife, beautiful scenery, and rich local cultures of the surrounding Karamojong communities. Upon arrival at Kidepo Valley National Park, you will be transferred to your lodge for dinner. You will have a full-day game viewing at the park. After your breakfast, you will head into the park, driving through the park, and here you will have an encounter with different residents of the park that include giraffes, buffaloes, elephants, zebras, lions, and many other different animal and bird species. You will return to the lodge for lunch and afternoon relaxation. Later in the evening, you will have a sunset game drive in the park then return for dinner. After breakfast, you will set off for another game drive at Kidepo Valley National Park. Explore the park to its fullest as you encounter different animal and bird species. Later in the afternoon, you will have a community walk to the local Karamojong communities who live around the park. These communities have got unique cultures and ways of life that will give you an experience with the true African cultures. After your early morning breakfast, prepare for your drive back to Kampala where you will have a stopover for lunch en route in Gulu and later proceed with your journey. This is the end of your safari trip. On day four, you will have a community walk to the local Karamojong communities who live around the Kidepo Valley National Park. Kidepo Valley National Park is a vast wilderness park in the northeast of Uganda located some 700 kilometers from Kampala. Gazetted as a national park in 1962, it has a profusion of big game. The park is a huge tract of rugged savannah with the adversity of wildlife, dominated by the 2,750-meter-high Mount Morungole, and transected by the Kidepo and Narus Rivers. #Of the 77 mammal species in the park, 28 cannot be found elsewhere in Uganda. Lions, cheetahs, leopards, greater kudu, beisa oryx can all be found among the various antelopes wandering the plains. There are over 500 bird species in the park. All this make it a very special place in East Africa. Because of its isolated location, there are few visitors. The Karamajong tribe, who live, for the most part, traditionally, add even more wonder to a safari in Kidepo. The rewarding game drives are the most attractive activity in Kidepo Valley National Park, but the Karamajong guided nature and community walks are a close second. In addition, many visitors avail themselves of the hiking trails up the mountain to explore some of the diverse vegetation and wildlife that is available. Still, others venture along Kidepo River to experience a natural sand river with all its trimmings. It goes without saying that Kidepo is a bird watcher's paradise where ostrich, the largest bird on earth, is an often sighting. 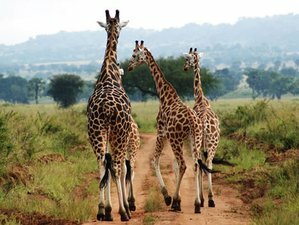 GoExplore Safaris is one of the leading tour operators in East Africa, bringing you a unique and wonderful experience through their expertise and commitment.